COLLEGE PARK, Md. — The next championship run is about to begin for the Terps. “Extremely excited to be hosting and obviously ready now for the NCAA’s,” said Terps Head Coach Brenda Frese. Three-seed Maryland plays 14-seed Radford on Saturday in the first round of the NCAA Tournament. The Terps are one of the host teams for the first two rounds. Maryland is 15-0 all-time in first round NCAA Tourney games under Frese. “We’re not focusing on future games. We’re just trying to focus on Radford now. We know they’re a pretty traditional team. We can’t look ahead at all,” added Terps guard/forward Kaila Charles. This is the ninth consecutive year Maryland has qualified for the tournament. But it’s the first go-around for the freshmen like Shakira Austin. Terps fans might not be too happy about the tip-off time. 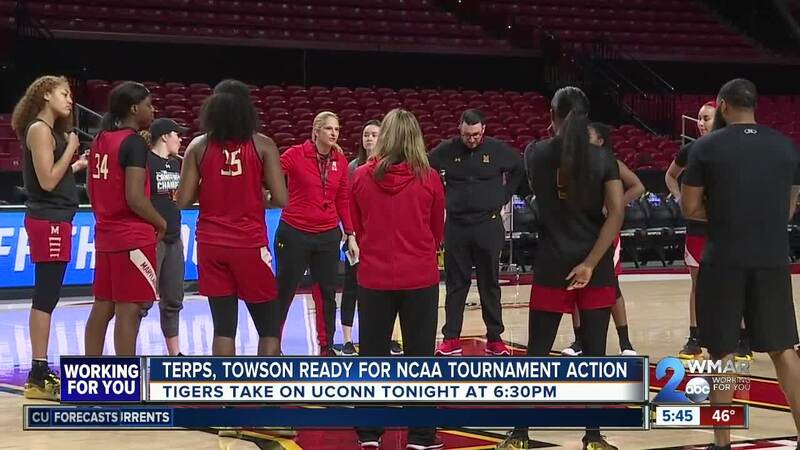 In a scheduling quirk, the women’s game will start at 11:00 a.m. That means it’ll be going on at the same time as the Terps men’s second-round contest against LSU, which tips just after noon on Saturday. While the Terps still have a little while to go before they open up tournament action, the Towson University women take the floor in Connecticut on Friday night. They’ll make history in the process. They’ll play the program’s first NCAA Tourney game. The Tigers are the Colonial Athletic Association Champions. They are the 15 seed and decided underdogs against perennial contender, second-seeded UConn. “There’s a lot of history with UConn basketball. But, I think that when we talk about teams and we talk about matchups, I think we match up very well with them,” said Tigers Head Coach Diane Richardson. Tip time for the Tigers and Huskies is set for 6:30 p.m. in Storrs, Connecticut.